Oral cancer is cancer of the mouth and can occur on your tongue, lips, gums, cheeks, throat and salivary glands. Oral cancer is officially an epidemic so early detection is critical. Shockingly the number of oral cancers has increased over a 6 year period, where all other cancers have declined. A very serious condition, oral cancer in its later stages is characterized by white or red patches on your soft tissues, mouth sores and ulcers that do not go away. At the dental office of Marvin Herschfus Family and Cosmetic Dentistry, we are committed to screen for oral cancer. We use the latest oral cancer screening device, Oral ID™, a 2 minute exam that can SAVE your life. Since the early stages are invisible to the naked eye, the OralID device allows Dr. Herschfus to detect even the most subtle changes. This simple screening is a simple painless procedure that utilizes fluorescence (light) technology to distinguish between healthy oral cells and abnormal or cancerous cells early before the tumor is visible to the naked eye. Oral cancers treated early have an 85% cure rate, while the advanced cancers only a 50% cure rate! 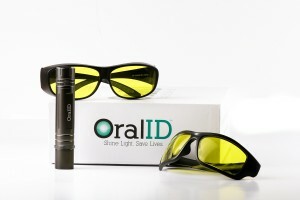 Dr. Marvin Herschfus simply wears the Oral ID glasses and shines the handheld OralID light device into your mouth. We will perform an oral cancer screening annually during your routine dental check-up or if deemed necessary, during other examinations. For more information about oral cancer in Berkley, Michigan, please contact Dr. Marvin Herschfus office in Berkley. We are eager to help ensure your smile stays healthy for a lifetime. Led by our experienced dentist, Dr. Marvin Herschfus, our dental team provides all of the dental treatments your family needs for long-lasting oral health. We combine the latest dental technology, including the DIAGNOdent, intraoral cameras, and patient education monitors, with first-class service and care for a positive dental experience.